Transitioning from volume-based to value-based payment and care delivery models in healthcare has been one of the most important industry-wide efforts over the past few years. When you think about it, the same kind of transition – from volume to value – has been playing out in marketing. So let’s give it a name. Let’s call it value-based healthcare marketing. 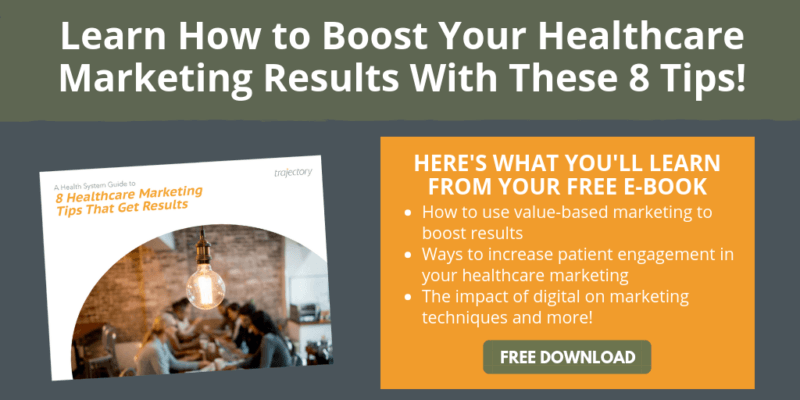 Borrowing on the idea of value-based care, value-based healthcare marketing isn’t predicated on the amount of healthcare advertising delivered, but on the ability of marketing to deliver outcomes and move people forward. In order to succeed in today’s environment, where consumers are driving the bus, many organizations need to rethink how they build and sustain their brands when it comes to value-based care. Because consumers are sending very clear messages – stop making empty promises and start acting in new and different ways. Build brands that help produce outcomes by doing things that really matter. Take a stand, act on your beliefs, provide social value. Does your brand simply articulate a higher purpose, or do you demonstrate ways to continually advance that agenda and build loyalty through action? Are your employees merely carriers of a message or are they true brand ambassadors equipped to act on the brand’s values in every customer encounter? Do you spend more time developing messages than designing customer experiences that provide genuine support to your customers’ lives? When you plan your marketing and communications, do you open up two-way pathways for continued engagement? Do you only benchmark and track your traditional competitors or are you following the actions of relevant disruptors outside of your category? Archetypes help us understand what motivates an individual, and they work in a similar way for a brand. When revealed — and put into action — these universal patterns of behavior help companies stay true to their mission, strengthen their promise and foster loyalty with all stakeholders. How do you define your values-based healthcare brand archetype? What is your behavior persona? Through the lens of archetypal thinking and borrowing on the ideas laid out in Margaret Mark and Carol S. Pearson’s book, The Hero and the Outlaw – here are a few examples to get you started. The Explorer. As the name suggests, The Explorer seeks to find fulfillment through discovery and new experiences. “Don’t fence me in,” The Explorer says. Red Bull, North Face and Jeep are ‘Explorer’ brands. The Sage. By utilizing intelligence and analysis, The Sage helps our world gain wisdom and insight. After all, “The truth will set you free.” Sage-like brands include Google, Barnes & Noble and The Discovery Channel. The Hero. All heroes help to improve the world. They are warriors, idealists and brave in nature. The Hero’s motto is, “Where there’s a will, there’s a way,” making it easy to assign the U.S. Army, Nike and BMW as ‘Hero’ brands. The Caregiver. As an archetype embodying pure altruism, The Caregiver protects others and is moved by compassion. “Love your neighbor as yourself,” is the adage of The Caregiver. Volvo, Heinz and Campbell’s are our favorite ‘Caregiver’ brands. The Creator. Seen as an artist and an entrepreneur, The Creator believes, “If it can be imagined, it can be created.” Innately self-expressive and non-conforming, The Creator archetype beats to its own drum and is wildly innovative. Adobe, Audi and HP greatly resemble ‘Creator’ brands. Power has shifted from companies to customers. And they want brands to stop making empty promises and start doing things that matter. Similar to the ideas behind the value-based care model, customers want value-creation and outcomes. Today, a brand is useful, meaningful and engaging – or it is moving toward irrelevance. Traditional outbound marketing (advertising) activities can be disrupted overnight. Consistent, authentic behaviors that reinforce your true-north are much more effective in creating the customers who create your brand which drives your business. Interested in creating more loyal customers. Let’s have a conversation. Reach out here.